Click here to see the Jonesboro Sun media coverage. Click here to see the KAIT media coverage. JONESBORO, AR – Ritter Communications is proud to once again participate in the 9th annual Hoping for a Cure event, which took place Friday, Sept. 28 from 11 a.m. - 1 p.m. in the parking lot of Pier One in Jonesboro. 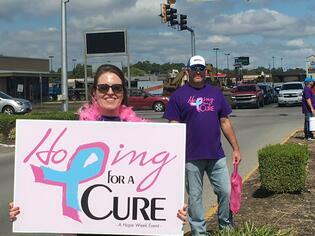 Volunteers collected donations from cars that passed through the intersection of Highland Drive and Caraway Road. A limited number of free mammogram and prostate cancer screening vouchers were available at Hoping for a Cure to those who qualify. The event, a partnership between Ritter Communications, NEA Baptist Hospital, East Arkansas Broadcasters and KAIT 8, hopes to raise awareness and funds for breast and prostate cancer during A Season of Hope 2018. "Early detection is key; resulting in quicker and better treatment for those with breast or prostate cancer. The screenings are an important part of early detection, as well as education about symptoms and risk factors," said June Morse of HopeCircle, a program of NEA Clinic Charitable Foundation. 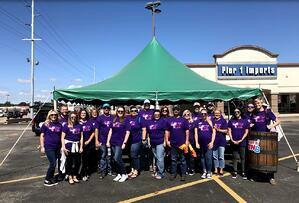 Volunteers from the sponsor organizations were on site during the bucket brigade to raise money for Susan G. Komen Foundation, the Arkansas Prostate Cancer Foundation and HopeCircle. Participants could also stop at the tent in the parking lot to pick up a goody bag and educational material, enjoy refreshments and sign up to win a free Roku. A Season of Hope, sponsored by NEA Baptist Charitable Foundation, is a unique community-wide, mutiweek-long series of events and activities designed to salute and highlight the spirit of hope and its importance in the life of our community. A Season of Hope is rooted in the belief that acts of goodwill are virtually always related to more beneficial life outcomes. For more information about A Season of Hope, visit www.NEABaptistFoundation.org. Ritter Communications, founded in Marked Tree, Arkansas and headquartered in Jonesboro, began providing local phone service in 1906. Today, Ritter serves 62 communities and more than 45,000 customers in northeast and north central Arkansas, southeast Missouri and west Tennessee with advanced voice and data services, TV, high speed Internet and hosted solutions typically found only in major metropolitan areas. Ritter invests heavily in the communities it serves by deploying proven, best in class infrastructure and technology while coupling it with a world-class customer focused experience. To stay connected, visit facebook.com/rittercommunications or rittercommunications.com.